With his 100 years anniversary just around the corner, Danish design icon Hans J. Wegner has become the center of a renewed international attention – resulting in new literary projects and exhibitions. 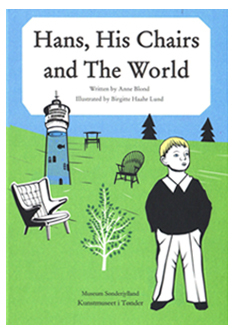 However “Hans, His Chairs and The World” is not a typical design publication – it’s a book for children. The richly illustrated book opens the world of the famous Danish furniture designer to the younger generations and draws attention to the old water tower in Wegner’s native city Tønder that has been transformed into a permanent collection of the Danish iconic chair designs. Since its opening, the Water Tower in Tønder has attracted many visitors ranging from adults to children to young people. For older visitors to the Water Tower, information about the Wegner collection is provided via model and drawing displays, as well as by factual texts and a film. Now with the publication of “Hans, His Chairs and The World”, children can read about Wegner’s chairs and the stories behind them. The idea behind the book is to make the Water Tower in Tønder and its permanent collection of Hans J. Wegner’s chair designs more accessible to the youngest visitors to the Museum. The book is intended for children from the ages of 3 to 11 years old. The book is also suitable for being read aloud to children. The book relates the story behind Hans J. Wegner’s motivation to become a cabinet maker. It also tells the story of Wegner’s sources of inspiration and his international breakthrough as a furniture designer. The work practices of a cabinet maker are described as well. The book also talks about the environmental concerns that are an integral part of the production of Hans J. Wegner’s chair designs. It is not necessary for an understanding of the book that you actually have to sit in the Wegner chairs at the Water Tower or visit the Water Tower at all. You can do this just as well by reading the book at home sitting in your sofa. The idea behind the book is to make the Water Tower in Tønder and its collection of Hans J. Wegner’s chair designs more accessible to the youngest visitors to the Museum. Its ultimate goal is to kindle a lifelong interest in craftsmanship, design and art for young people. Museum curator Anne Blond has written the text while artist and illustrator Birgitte Haahr Lund has created the illustrations for the book. Although the illustrations were created digitally on the computer, their inspiration stems from old wood block prints and the rough hewn texture of wood cuts. The final result is a unique mix of the classic and the contemporary. It traces its origins to the craftsmanship of the furniture designer Hans J. Wegner; yet it also appeals to the sensibility of today’s children. The book is published by the Art Museum in Tønder with support from the following sponsors: Træfonden, Tønder Bank, Venner af Kunstmuseet i Tønder, Scandinavian Living, Dansk Vinlager, Tønder Kommune, Tønderhus Fonden, P. J. Schmidt fonden, Museum Sønderjylland Kulturhistorie Tønder, Tønder Museums Vennekreds, Hans J. Wegners Tegnestue A/S and PP Møbler.